The Ducks are in uncharted waters. The #5 Oregon Ducks Women’s volleyball team entered the second round of the NCAA tournament for only the third time in the history of the program. In their previous attempts, the Ducks did not advance past the round of 16. Emotions ran high against the #12 BYU Cougars on Friday. Although they would wind up winning the match 3-1 (25-23, 25-21, 22-25, and 25-12), the first three sets against BYU were nailbiters. The Ducks easily pulled away in a 4th set that had none of the drama of the first three sets. As we have seen in so many games, the offensive combination of Alaina Bergsma, Liz Brenner, Ariana Williams, and Katherine Fischer was too much for the Cougars. If a Duck was hot, getting the kills, and was keyed on, then that would just open up looks for other Ducks. Ultimately, BYU could not withstand perhaps the finest game in Liz Brenner’s career, as she exploded for an incredible 27.5 points for the match! Liz Brenner had a career game against BYU. Defensively, the teams were even on blocks. The Ducks committed more errors overall than BYU, and on a different night that might have worked against them. The Ducks, however, hunkered down on defense and it showed in Oregon’s dominant performance in digs — 73 to 58 by the Cougars. The victory meant that the Ducks would be playing in the Elite Eight for the first time in the history of the volleyball program. Coach Jim Moore has every right to be proud of what he has put together in perhaps the strongest volleyball conference in the nation. That was the good news, though if there was bad news, it was that the Ducks next had to face #4 Nebraska. If you were looking for additional adversity, then you had to look no further than the fact that this second round was being held in Omaha. The Ducks would be facing Nebraska in front of a crowd that was going to be quite partial to their Huskers. 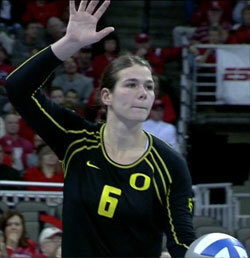 The Ducks came out flat in the first set against Nebraska. They were unsettled, disjointed; rarely have we seen rougher set play on the part of the Ducks. To make matters worse, the Cornhuskers were an unstoppable offensive force. They were an incredible killing machine, with well placed shots against a Duck defense that was struggling to get it together. The Ducks were completely off their game and dropped the first set 14-25. It looked bad — the match felt like the Ducks would be packing the bags for an early trip back to Eugene. My, what a difference a set makes. The Ducks completely turned things around in the next 3 sets, winning them 25-20, 25-18, and 25-17. They were dominant, and even when the Huskers pulled ahead in the 4th set, one had the feeling that the Ducks were not in the rough waters they found themselves in during the first set. They had all the momentum, and were going to take it to the house. You’re going to hear about the great play of Bergsma, as the PAC-12 Player of the Year had another great match. The player of this match, however, was Ariana Williams. In the second and third sets, Williams carried the Ducks with monster kills off the right side. 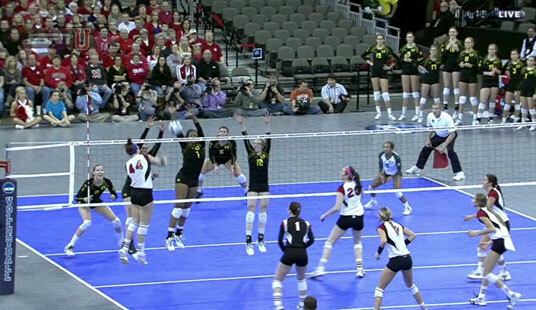 Ariana’s points were decisive, fast, and ultimately daggers in the hearts of the Nebraska players and fans alike. Williams would finish with 13 kills and 13.5 points. In primarily the 3rd and 4th sets, Katherine Fischer was a force to be reckoned with on the left side. With only a couple of exceptions, she was as dominant on the left as Williams was on the right. Fisher would end with 12 kills and 13.5 points. Nebraska had too much to contend with. After the first set, Lauren Plum was flawless in her setups, and make all the correct decisions. With the Huskers having to contend with great play from Williams and Fisher, the gates opened up for Bergsma, who finished her match with 23 kills and 23.5 points. Lauren Plum has made all the right decisions all tournament. The Ducks defense was nowhere to be found in the beginning of the match. That changed after the first set, as the Ducks settled down and were more successful in going after the ball, and getting digs. Libero Haley Jacob had a stellar 2nd, 3rd, and 4th set, with 21 digs for the match and outstanding defensive play. Now the Ducks are in uncharted territory. 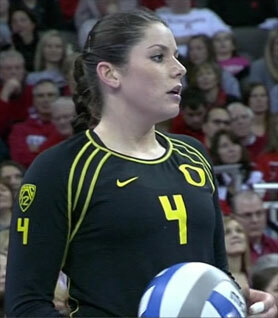 Oregon has never been in a volleyball Final Four. Keeping their emotions in check and not faltering on defense will be crucial as they take on #1 Penn State, December 13, in Louisville, KY. The Ducks will need to keep their cool and play some of their best ball against one of the best teams in the country. You owe it to yourself to see this fantastic Ducks team as they continue to make history in being the greatest Duck volleyball team ever! Two matches — two more matches and the Ducks could take it all, and go where no Ducks have gone before.